This year’s International Conference on Textures of Materials (ICOTOM-18), to be held on November 5-10 in St. George, Utah will feature a symposium honoring CDAC Academic Partner Hans-Rudolf Wenk. 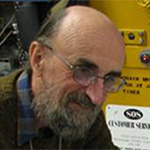 The symposium, “A Celebration of the Contributions of Rudy Wenk to Texture Analysis,” will recognize Professor Wenk’s many impacts on the field through his long and distinguished academic career. At ICOTOM-18, Professor Wenk will also deliver a plenary address entitled, “How Textures Helped Us Understand Deformation in the Earth.” More information on the meeting may be found here. The entire Center extends its congratulations to Professor Wenk on his many important scientific achievements.